April 20, 2015 - Hamilton School District. Every year the Hamilton School Board reviews a first draft of the district’s budget in spring and by the end of May approves a final budget to present at its Annual Meeting in June. Because of the state biennial budget uncertainty, the budget planning process in Hamilton will not be as straightforward this year. The district must wait for state Legislators to finalize their budget which provides critical information regarding revenue caps and state aid. accepted bids for construction of a high school classroom addition to deal with increased enrollments. Board members noted that while they hoped to avoid cutting positions, state statute requires that certified staff members be notified in April and again in May if they potentially will not be offered a contract for the next school year. The classroom addition project will add 10 classrooms, two smaller class spaces, restrooms, lockers and a large group area. With furniture costs included, the School Board approved construction of the facility not to exceed $4.37 million. The project will be a one-time expense taken from the district’s maintenance budget and fund balance without increasing taxes. Construction will begin in May and is expected to be ready for student use in January, 2016 to deal with increased enrollment at the high school. The proposed district budget comes in at $53.1 million, which is up by 1.98 percent over last year because an additional 25 students are anticipated. With property value in the district projected to increase by 2 percent, the mill rate is expected to drop from $9.76 to $9.56 per $1,000 of property – a 2.12 percent decrease. More information about the state budget and its impact on the Hamilton School District is available here. 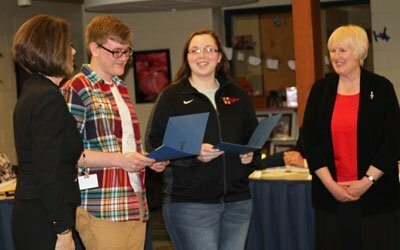 Music teacher Jill Casper and high school students Jonah Brown and Kate Meagher were recognized for their work on Lannon’s Band Buddies Program that was started in 2011 by Miranda Brown. The program links high school and elementary band students to create a cross-generational learning experience..
accepted the resignations of Willow Springs part-time custodian Ronald Bard, Hamilton science teacher Kimberly Leannais and Templeton grade 8 teacher of Kristin Higgins.